India is a melting pot of different cultures, traditions, ideologies, and of course food. Mumbai, its financial capital, is no different. Other Indian cities have a food culture that is closely tied to region or ethnicity, but Mumbai’s food styles and flavours are a reflection of the migrant population that call it home. Travel by a local commuter train and you’ll hear conversations in half-a-dozen languages. This diversity which gives the city its unique cultural and cosmopolitan identity is mirrored by its street food. They represent culinary habits and tastes of those locals who brought certain food traditions to their adopted home. Kokata has its kathi roll while Mysore serves you dosas with pride. Hyderabad welcomes you with aromatic biryani and Chennai with pongal. Amritsar offers mouth watering lassi and Ahmedabad lines up deep-fried savouries. Mumbai serves all this and more. Feeling lonely and homesick? Walk down to the nearest street vendor. Tuck into delicious and familiar foods while you strike up a conversation with other foodies. Light on the wallet, ready-to-eat food, innumerable options (vegetarian and meat) – these are a few reasons why open carts, juice stalls, hole-in-the-wall eateries, and khau gallis (eating lanes) are firmly entrenched in the city landscape. From as local as you can get snacks like vada pav and misal pav to samosa, sandwiches, and Chinese bhel, you’ll find something that tickles your taste buds and makes your heart long for more. Sip your cutting chai and dunk your aloo tikki in spicy gravy while we prowl the streets of Mumbai smelling and tasting 10 evergreen delights! 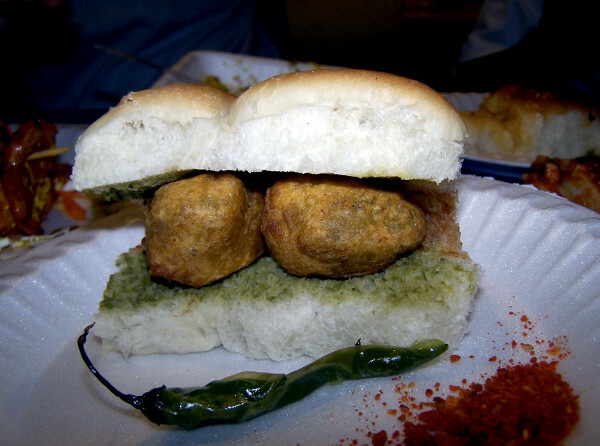 The Indian bun lends itself to many street foods in Mumbai including anda (egg) pav, samosa pav, kheema (minced meat) pav, bun muska, misal pav, and dhabeli. 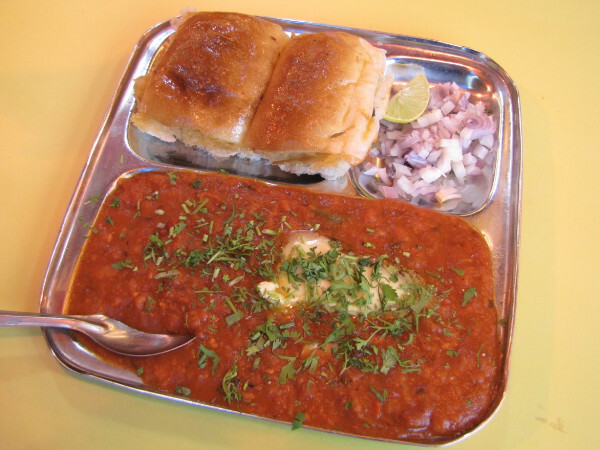 Pav bhaji is a spicy meal in itself. Sliced pav is toasted with a generous helping of butter and served with vegetable gravy that contains cooked vegetables (potatoes, green peas, tomatoes, onions) and spices. 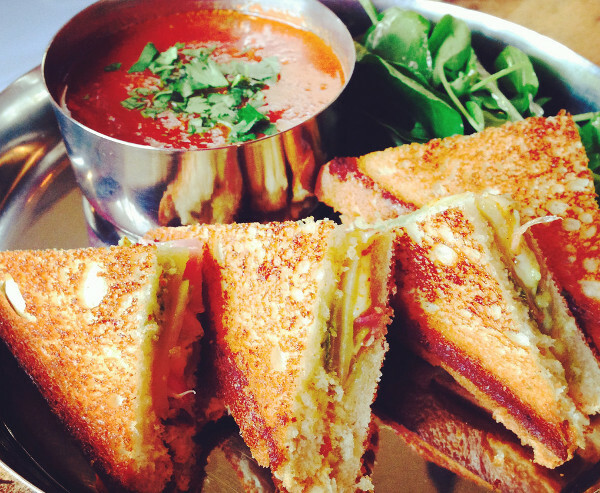 Usually served with a slice of lemon and raw onion rings, some versions have cheese or paneer toppings. You’ll even find the Jain version which has no onion or garlic in it. This is a delightful combination of deep-fired potato pattice and tangy, spiced -up chickpeas gravy. A dash of salt and light spices are added to boiled and mashed potato which is then shaped into round pattice and deep-fried (aloo tikki). 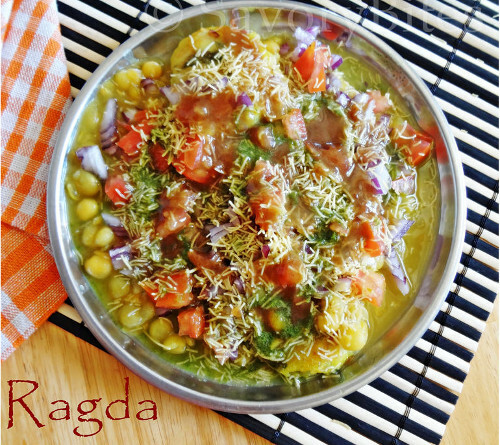 This is accompanied by Ragda – chickpeas stew with tomatoes, onions and spices and topped with fresh cilantro, and chopped onions. This sandwich is a unique Mumbai creation with thinly sliced onions, boiled potato, tomatoes, beets, cucumbers sandwiched between white bread slices. One slice is buttered while the other gets a dollop of mint chutney. Squeeze some tomato sauce or ketchup on top, cut into four triangles and enjoy the crunch of vegetables and tangy flavour. You’ll find grilled or toasted versions sold by vendors, particularly outside college and office buildings. Take this Maharashtrian fast food off the streets, and Mumbai loses half her identity. This fritter contains mashed and boiled potatoes combined with ginger, garlic, turmeric, cilantro leaves and, lemon juice, and is dipped in gram flour batter and deep fried in oil. Add plain or spiced bun, green chillies, and some green/tamarind chutney to the mix and you’ll realise why mumbaikars swears by this dish. 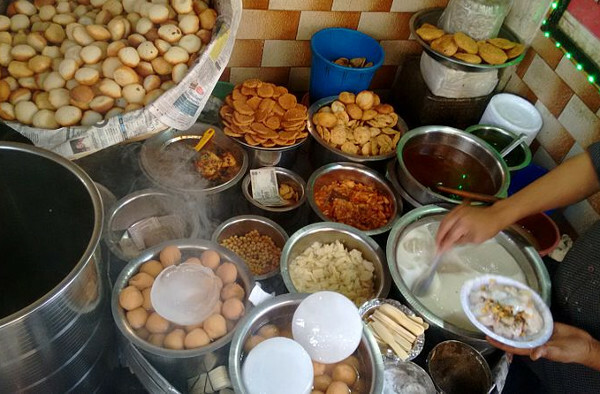 Mumbai is no stranger to chaats with pani puri, bhelpuri, Chinese bhel, dahi vada, sevpuri , papadi chaat and many others calling out to you from counter tops of street stalls and small eateries. You can ask the vendor to increase sweet, spicy or tangy quotient of chaats to suit your palate. 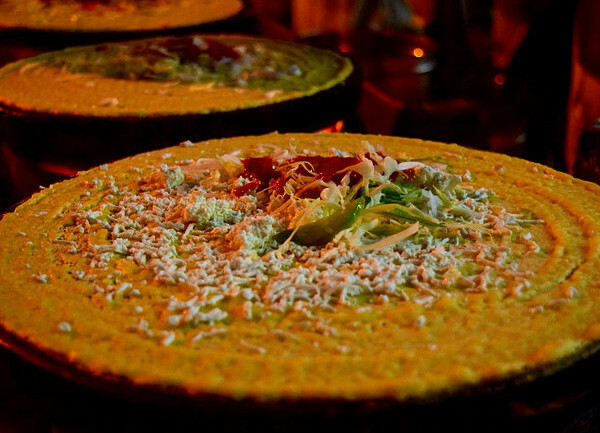 With a sizeable south Indian population in the city, can the dosa be far behind? These savoury pancakes/crepes made with fermented rice and lentil batter come in numerous avatars. From Paper Roast, and Mysore Masala to Spring and Schezwan Dosa, Mumbai’s dosa is definitely different from its cousins back in the south. Served with different types of chutneys and slightly sweetish sambar, these scrumptious delights will have you begging for more. Another food invention by enterprising vendors, Frankie is the city’s answer to Kathi rolls and Mexican wraps. 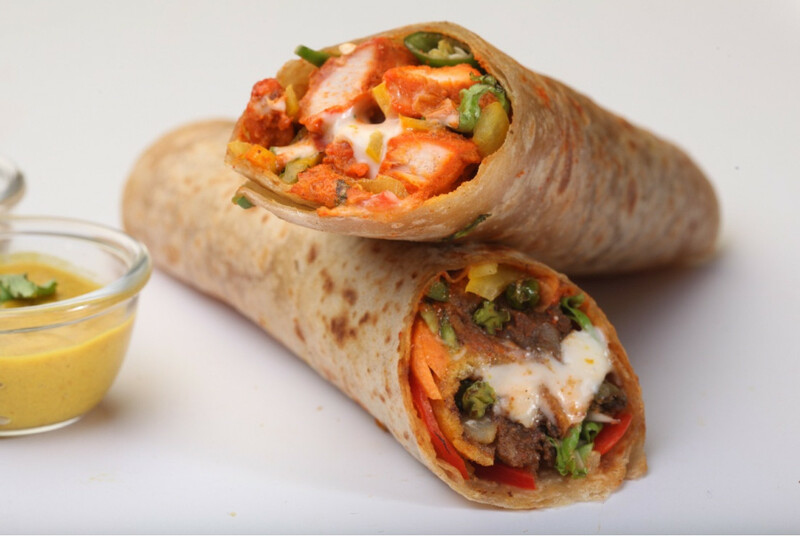 The flatbread wrap (made from refined or whole wheat flour) contains different fillings including mutton, chicken, vegetables, paneer, or eggs sautéed with spices, sauces and aromatics. This comes wrapped in tissue paper making it a perfect eat-on-the-go snack. This Arabic delicacy feels right at home in India. Visit Muslim neighbourhoods during Ramadan to enjoy succulent kebabs, bheja (goat brain) fry, and other meat dishes. 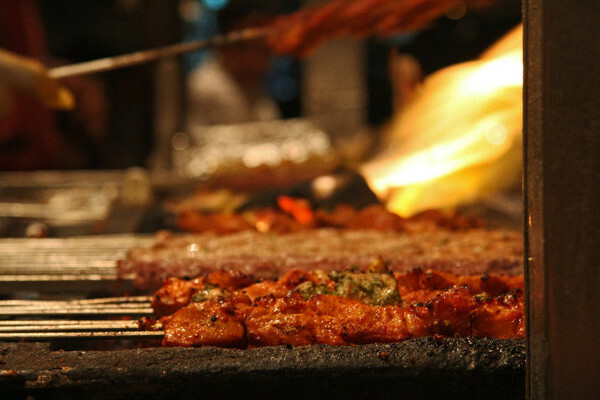 Chunks of meat, including kidney and liver, beef, fish are marinated in spices and grilled on skewers over charcoal pits. Top with sliced onions and squeeze of lemon/lime, these are a meat lover’s delight. Vegetarians can settle for green kebabs or vegetable platters. A chilled dessert in a glass – that is Falooda for you. A local adaption of a Persian dish brought over by Moghuls, this is made with flavoured milk and topped with nuts and layers of other ingredients. These include vermicelli, sabja (Thai basil) seeds, rose syrup, and 1-2 scoops of ice cream. 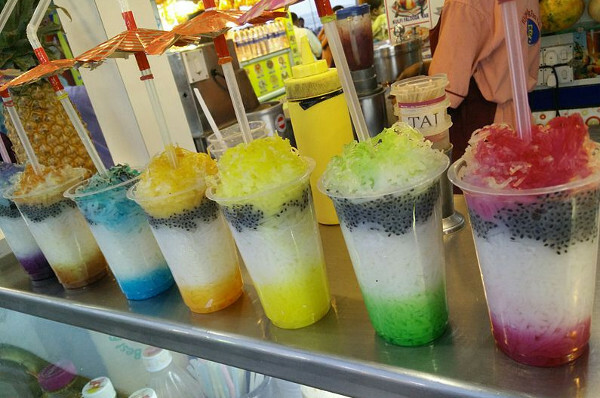 You’ll find falooda in varied flavours including chocolate. 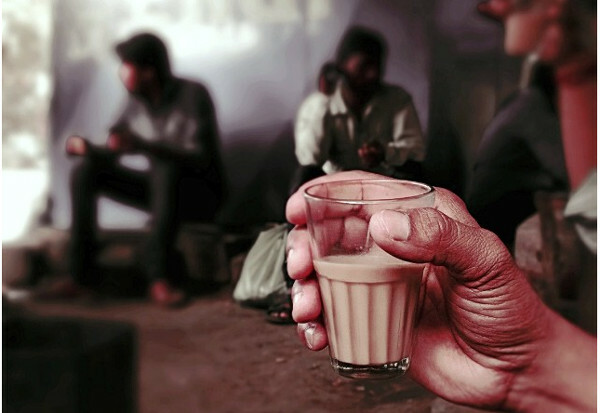 The cutting chai is a hit with college students who are low on cash. Ask for one cutting and you literally get two glasses half-filled with strong, milky and sugary tea brewed with aromatic spices. Have you tasted any of Mumbai’s fast foods? Is there a street food that you’ll love to try again? Book marking this for when I make it to Mumbai! This is making me hungry! I love street food – best way to really experience a new area! the pics and your descriptions made me hungry!! You were really able to show a variety and I like that, so anyone travelling can have tested options. This food looks great! If I ever visit Mumbai I know where to go!